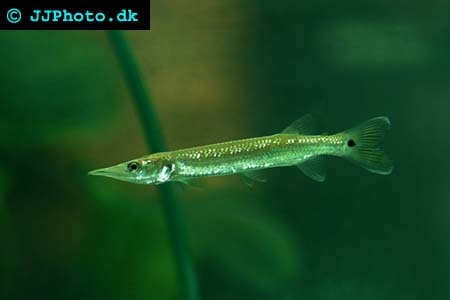 Company: Ctenolucius hujeta (Freshwater Barracuda) should only be kept with other peaceful species that are too large to swallow. Aquarium setup: Ctenolucius hujeta (Freshwater Barracuda) requires a large aquarium tank. The aquarium should be densely planted in the back and along the sides but still provide plenty of open space in the center of the aquarium for the fish to swim on. They are excellent jumpers and a well covered aquarium is a necessity. They seldom grow to their full length in aquariums. This species is best kept in schools. 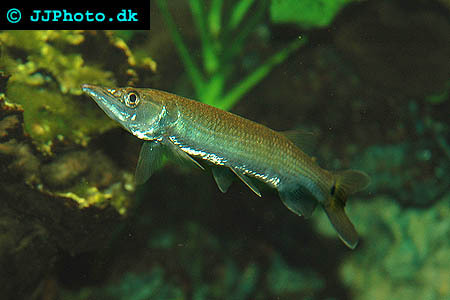 Feeding: Ctenolucius hujeta (Freshwater Barracuda) can be hard to feed and often only accepts live food of suitable size. Some specimens can be thought to eat dead food but most Ctenolucius hujeta (Freshwater Barracuda) will only taste it and spit it back out. Breeding: Ctenolucius hujeta (Freshwater Barracuda) breeding is hard but possible. Keep one male with two females in a large aquarium. Condition them well before trying to get them to spawn. An increase in the temperature seems to help trigger spawning. The temperature might have to be raised a little above their normal temperature span (22-26°C / 72-79°F) This species is very productive and one spawning can result in more then 1000 small Ctenolucius hujeta (Freshwater Barracuda).